Stitchery is understood as the process of working with needles, or needlework, including knitting, crocheting, embroidery, etc. Stitching, in the most basic sense, is a form of sewing. The history of sewing dates back to the stone age, where archaeologists believe people across both Asia and Europe “sewed” their clothes. Clothing made of fur or animal skin with a sliver of an ivory tusk as the needle, and animal veins or tendons used for the string. The needle and thread have come a long way from this, but the history of stitching is one that is truly treasured by those who practice this art form. As more textile fabrics were produced, such as fine wool, silk, and cotton, stitching techniques improved as well. It was not until the invention of stainless steel in 1913, that we began to see a needle that is similar to what we use today; one that won’t leave a mark on the fabric. Here to the left you can see a Sewing Bird, commonly used since Victorian times as a helping hand, or bird for that matter, when completing hand stitching projects. 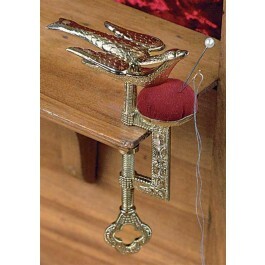 The mouth of the bird holds the piece of fabric or other bits in place while the pin cushion keeps track of pins and needles. As the textile industry was booming in the 19th century, many women who had practiced sewing their whole lives took to the factories to use their skill. Of course, the invention of sewing machines assisted in mass production. The sewing machine went though a variety of models at first, with many inventors trying to claim the patent. This included Isaac Merritt Singer, who is responsible for crafting sewing machines with straight needles. Here we will take a look at just a few of the many stitching styles, that can now be done either by hand or machine. A running stitch is perhaps one of the easier and more popular stitches. It is formed by passing the needle and thread through the fabric in a line to form the desired length. this stitch is great for sewing together seams, patchwork, and quilting. A good example of this is Family Pillow. 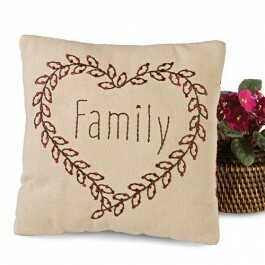 As precious as a child’s interpretation of art, this Family Pillow holds family close within the heart. The running stitch creates a smooth line which is easy to see because of the simple heart shape and lettering. The blanket stitch is typically used to give a finished look to blankets, though of course can be used on other items. It is formed by making sure that when looping the thread, it goes under the needle and is pulled tight. Taking the needle to the back each time will help to secure the previous loop. This process exposes a full loop of thread, creating the large blanket stitch look. 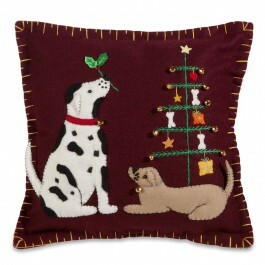 An example is our Presents For Pups Pillow. The black blanket stitching around the pillow gives this accent a homemade feel. A twist on the basic running stitch is the increasingly popular, vermicelli stitch. It is more or less the same as a running stitch, except each stitch is taken in a different direction. It can be a pattern such as a zigzag or completely random. 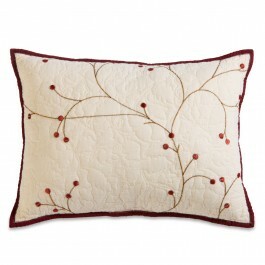 Many of our quilted products feature this festive stitch. 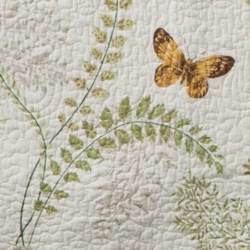 Here to the right is a close up look at our Fern Garden Quilt. The vermicelli stitching on this lovely collection is done in a swirling design on the cream background. Be sure to click on the product page to get a closer look at this stitching style. Cross-stitch and needlepoint are two of the oldest forms of counted thread embroidery. “Counted-thread” typically refers to an ‘X’ shaped stitch that is used to create a picture or other detailed pattern. 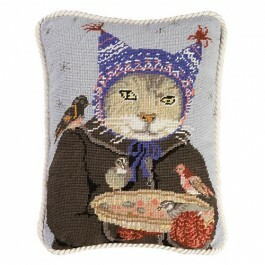 Cross stitching is usually seen on linen fabric and often on top of a printed pattern or material, whereas needlepoint covers an entire surface, as seen here on the Cat in Hat Pillow. This entry was posted on Monday, December 30th, 2013 at 8:00 am	and is filed under Apartment, Bedroom, Crafting, History, How To, Sewing Techniques. You can follow any responses to this entry through the RSS 2.0 feed. You can leave a response, or trackback from your own site.